We had a ton of creative, crafty and achingly adorable submissions to our Inhabitots Green Halloween Costume Contest this year, and we were left with the difficult task of narrowing down the cuteness to a handful of winners. Faced with a bevy of impossibly cute faces clad in super-creative homemade costumes, “just a few” was a little beyond our reach and we quickly found ourselves with this list of 32 finalists! But in the end it was up to you, dear readers, to decide which little Inhabitots had the cutest, cleverest and and most creative costumes of them all. So without further ado, we present to you this year’s Inhabitots Green Halloween Contest winners! 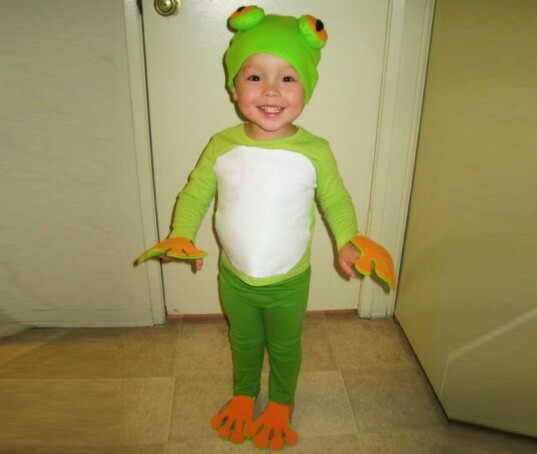 Voters were struck by this adorable frog costume (and probably the adorable beaming smile didn’t hurt) made by Mika Walton for her little cutey — which nabbed 211 votes for the grand-prize win! 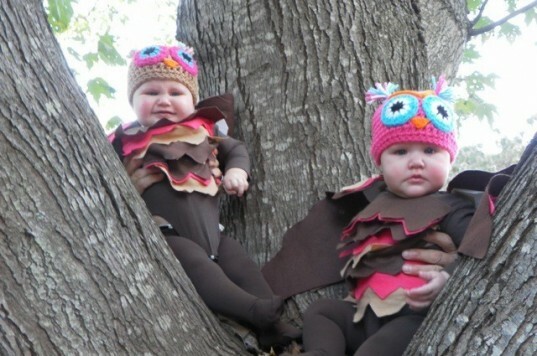 With 200 votes, just 11 shy of the win, Shannon Stoughton’s eco-lovely baby owls won second place! 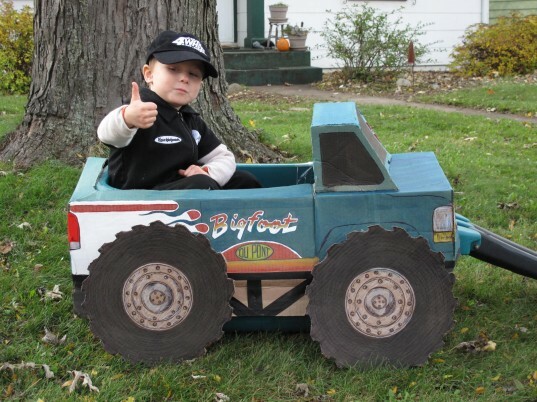 Coming in with 162 votes, Kris Pinkerton’s stylin’ son stole third with his zero-emission monster truck! 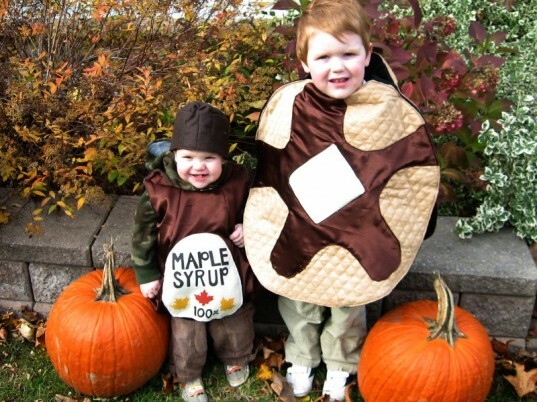 For over a year Erin Corbett’s son Miles has been saying he wants to be a pancake for Halloween, with his younger brother as the maple syrup. We’re definitely suckers for costumed duos, and this sweet pair was no exception! 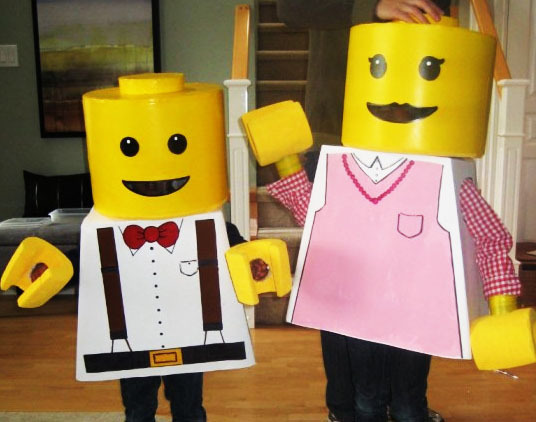 Jessica G and her husband made these incredible costumes for their 4 and 6-year old Lego fans, and stole our Lego-loving hearts with their creativity! 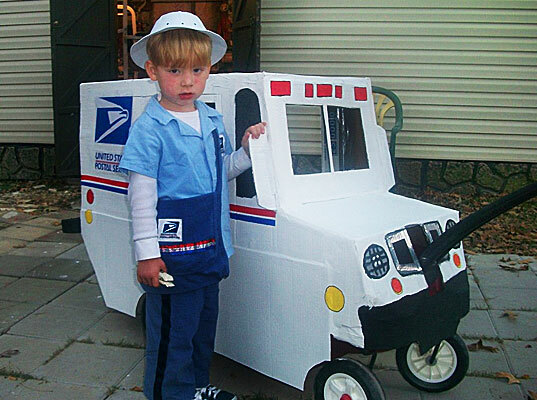 Micah The Mailman was another one of our favorites, especially for his adorable getup and recycled cardboard postal truck! We’d like to extend a heartfelt thank you to all the parents and kids that participated in this year’s Inhabitot’s Green Halloween Costume Contest. And for those of you who haven’t gotten enough “oohs” and “awws” in for today, check out the Inhabitot’s Green Halloween Costume Contest and the gallery below for even more cute costumes! Congratulations to all the winners and entries too - great jobs on all the costumes! Fantastic costumes, I wish I had entered mine! We had a ton of creative, crafty and achingly adorable submissions to our Inhabitots Green Halloween Costume Contest this year, and we were left with the difficult task of narrowing down the cuteness to a handful of winners. Faced with a bevy of impossibly cute faces clad in super-creative homemade costumes, �"just a few" was a little beyond our reach and we quickly found ourselves with this list of 32 finalists! But in the end it was up to you, dear readers, to decide which little Inhabitots had the cutest, cleverest and and most creative costumes of them all. 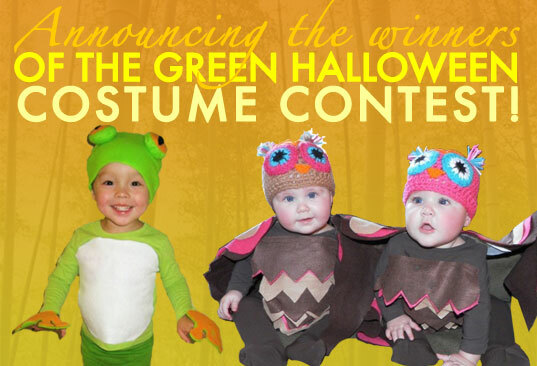 So without further ado, we present to you this year�s Inhabitots Green Halloween Contest winners!